John Cope and Suzan McGladdery welcome businesses to an informal networking event. On Tuesday 3 July, businesses attended a breakfast networking event to hear from the Confederation of British Industry (CBI). Attendees heard from John Cope, Head of Education and Skills at the CBI and Suzan McGladdery, Director of Business Development at Barnsley College. John talked about the work the CBI has completed on the ‘Perfect Harmony Report’ and the value this provides for businesses, students and training providers. John also explained why there was a need for the apprenticeship reforms from the CBI’s perspective and the impact this will have on businesses of all sizes and industries. Suzan provided an apprenticeship update, which included the funding reforms, the new apprenticeship standards and changes to the education system in the coming years. Suzan added: “This informal event provided the attendees with an opportunity to speak directly to the CBI, an organisation who provides a voice for all businesses, about the issues they are facing when recruiting new employees who haven’t got the skills their business needs. 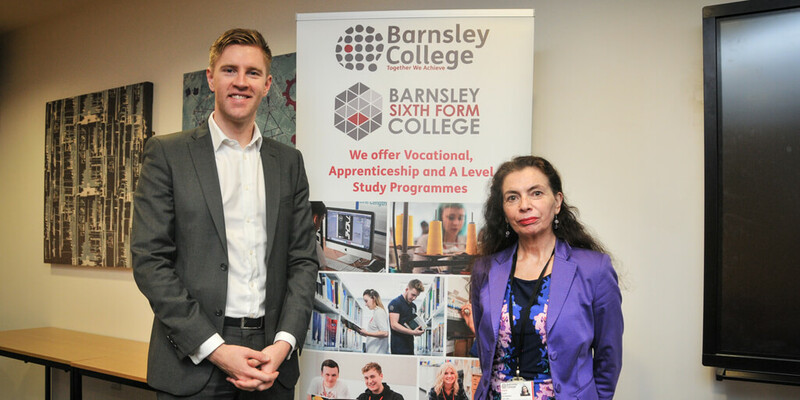 If you would like to find out how the College can support your business to recruit an apprentice or to develop your existing employees’ skills, contact the Business Development Team by calling 01226 216 166, emailing employer@barnsley.ac.uk or visiting the Services to Business department page.